Yamaha "Nice Ride" Donation Program supports the training of guide dogs 2006 Presentation Ceremony held at the Yamaha Fan Booth in Japan GP - News Releases | Yamaha Motor Co., Ltd.
Yamaha Motor Co., Ltd. and its sales company Yamaha Motorcycle Sales Japan Co., Ltd. (YMSJ) announce the 2006 results of its Yamaha "Nice Ride" Donations charity program that has started in 1989. The donations collected during the 2006 program period reached a total of ¥5,992,000, and ¥63,217,665 for the cumulative total. On Sept. 22, 2007, the 2006 donations were presented to representatives of the Japan Guide Dog Association (JGDA) in a donation ceremony at the Yamaha Fan Booth of the Japan GP, round 15 of the MotoGP championship series held at the Twin Ring Motegi circuit in Tochigi Pref. Attending the donation ceremony were guide dog owner Mr. Nobuo Kanto and his dog Rose (Labrador retriever), Mr. Yoshiyuki Yamaguchi, manager of the JGDA, Susumu Ishizuka, Sales Operations of YMSJ and the Yamaha representative rider now participating in the MotoGP series, Valentino Rossi (Fiat Yamaha Team). Yamaha presented its donation program records and received a certificate of appreciation in recognition of its activities from Mr. Yamaguchi. The Yamaha "Nice Ride" Donations program has been continuing for 18 years under the slogan of "Let's help the visually challenged get guide dogs so they can walk the streets with confidence." Donations have been collected from our customers at the nationwide Yamaha motorcycle dealerships as well as at the various Yamaha events like races. Donations have also been received from Yamaha riders and race officials, Yamaha owners' club members, stockholders and others. 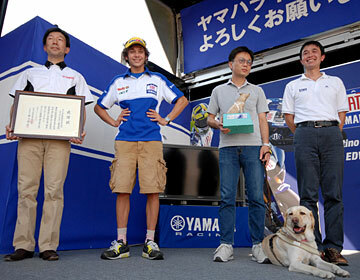 Yamaha will continue and support its donation program activities again in 2007. With regard to these efforts we ask for the kind support of everyone. Mr. Yamaguchi: "Guide dogs open many possibilities for the visually challenged, as they allow them to go where they want, when they want. There are 960 guide dogs in Japan, but there are 7,800 people who need them. There are still not enough guide dogs. We would like to make use of everyone's donations to actively train guide dogs. As well as asking for your continuing support, we hope everyone will also learn more of the facts about guide dogs." S. Ishizuka: "We appreciate everyone's understanding and support in continuing this fundraising event over many years. We would like to continue this activity to contribute to the training of as many guide dogs as possible, and we ask for your ongoing cooperation." V. Rossi: "As a person who usually makes efforts to contribute to society, I think it is wonderful that Yamaha have been carrying out these kinds of activities over so many years. It has been my honor to be able to participate in this event since last year, as a representative of the Yamaha riders." "Let's help the visually challenged get guide dogs"
At the time this program was first undertaken, Japan had far fewer guide dogs available for the visually challenged than countries like the U.S. and Europe where the use of guide dogs has an established tradition. This was due to a lack of information about guide dogs and interest in them by the society at large, as well as the poor financial situation of organizations that trained these dogs. The Japan Guide Dog Association (JGDA), which is the recipient of the donations from Yamaha's "Nice Ride" program, was also dependent on private donations from charities at the time. In its search for ways to contribute to society as a member of the transportation industry, Yamaha approached the JGDA, after learning about the need for more guide dogs, and offered to begin a donation campaign. That was the start of the Yamaha "Nice Ride" donation program. Since then, we have placed donation boxes in Yamaha motorcycle dealerships nationwide as well as soliciting donations at events around the country and at race venues. These efforts have helped raise consciousness of guide dogs among motorcycle owners and the society at large and resulted in many donations. The program has also won the support and participation of Yamaha race riders and race officials, Yamaha owners' club members, our stockholders and others. Donations from all these people have helped bring the total donations from the Yamaha "Nice Ride" program for these 18 years to over ¥63,210,000. During the 2007 Yamaha "Nice Ride" Donations program period (July 1, 2007 - June 30, 2008) we continue to solicit donations at Yamaha motorcycle dealerships nationwide, at events around the country and at race venues as well as conducting charity activities like auctions at various events. We also seek donations from the general public for which a special bank account has been established. Donations can be made to the Yamaha "Nice Ride" Donations at the bank account below.